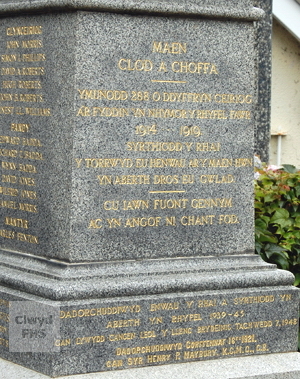 The Glyn Ceiriog War Memorial commemorates those local men of Glyn Ceiriog, Pandy and Nantyr in the Ceiriog Valley who were killed in World War I and World War II. The unveiling ceremony took place on 6th Jul 1921. Llansanffraid Glyn Ceiriog is a rural community and ecclesiastical parish on the River Ceirog in the County Borough of Wrexham. Until 1974 the area was part of historic Denbighshire, and between 1974 and 1996 part of the county of Clwyd. 12030 South Wales Borderers (1st Bn.) 11 Jul 1918 29 Son of John & Jane Bather, Tan y Graig, Pandy, Glyn Ceiriog. Husband of Mary Elizabeth Bather, 1 Pandy Terrace, Chirk. Brother of Richard Thomas and Wynn Bather below. Border Regiment 27 Aug 1918 18 Son of John & Jane Bather, Tan y Graig, Pandy, Glyn Ceiriog. Brother of Edward Bather (above) and Wynn Bather (below). Quarry Cemetery, Montauban, Somme, France. (4th Bn.) 3 Sep 1916 24 Son of John & Jane Bather, Tan y Graig, Pandy, Glyn Ceiriog. Brother of Edward Bather and Richard Thomas Bather (above). Resident of Aberteirw Terrace, Llansilin. Also commemorated on the Llansilin War Memorial. Caterpillar Valley Cemetery, Longueval, Somme, France. (16th Bn.) 22 Apr 1918 22 Son of Edward Edwards, of 5, Railway Terrace, Glyn Ceiriog. Bouzincourt Ridge Cemetery, Albert, Somme, France. (16th Bn.) 11 Jul 1916 28 Son of Edward Edwards, of 5, Railway Terrace, Glyn Ceiriog. Thiepval Memorial, Somme, France. (10th Bn.) 30 Sep 1917 19 Son of Thomas & Susannah Evans, of 4, Cambrian Terrace, Glyn Ceiriog, Chirk. Brother of Thomas Idwal Evans below. Lijssenthoek Military Cemetery, West-Vlaanderen, Belgium. (2nd Bn.) 27 May 1917 21 Son of M Evans, of Wynne House, Glyn Ceiriog, Chirk. Arras Memorial, Pas de Calais, France. (8th Bn.) 22 Apr 1916 24 Son of Thomas & Susanna Evans, 4 Cambrian Terrace, Glyn Ceiriog, Chirk. Brother of John W Evans above. Basra Memorial, Iraq. (9th Bn.) 25 Sep 1915 35 Of Nantyr, Glyn Ceiriog. Loos Memorial, Pas de Calais, France. (3rd Bn.) 18 Apr 1915 27 Son of the Rev. F W & Emily Frances Job, of Lower Gornal Vicarage, Dudley, Worcestershire, England. Also commemorated on the Pontfadog War Memorial. Menin Gate Memorial, Ieper, West Vlaanderen, Belgium. JONES Of Pandy, Glyn Ceiriog. 201290 Royal Welsh Fusiliers (1st/4th Bn.) 10 Jul 1917 25 Son of Thomas and Mary Jones, Yr Addwy, Llansantffraid. Bus House Cemetery, West-Vlaanderen, Belgium. (21st Bn.) 27 Sep 1916 30 Son of Dr. & Mrs Griffith Jones, of Glyn Ceiriog; husband of Mary Winifred Allsworth Jones, of West Court, Bridgend, Glamorgan. Heilly Station Cemetery, Mericourt-l'Abbe, Somme, France. (2nd Bn.) 18 Oct 1918 27 Son of Robert & Elizabeth Jones, of Royal Oak Terrace, Glyn Ceiriog; husband of Jane Ann Jones, of Bryneglwys, Garth, Glyn Ceiriog. Vis-en-Artois, Pas de Calais, France. (16th Bn.) 18 Sep 1918 29 Son of Henry David and Mary E Jones, Isfryn, Glyn Ceiriog, Ruabon. Also commemorated on the Ruabon War Memorial. Gouzeau New British Cemetery, Nord, France. (2nd/5th Bn.) 28 May 1917 Son of Maurice Morris & the late Margaret E Morris, of Upper Mill, Glyn Ceiriog. Cambrin Military Cemetery, Pas de Calais, France. ("A" Coy. 1st Bn.) 1 Oct 1917 20 Son of Thomas & Jane Morris, of 1, Cambrian Terrace, Glyn Ceiriog. Tyne Cot Memorial, West-Vlaanderen, Belgium. (6th Bn.) 13 Apr 1918 25 Son of Edwin & Mary Morris, of Cam Helyg Ucha, Pandy, Glyn Ceiriog. Bethune Town Cemetery, Pas de Calais, France. (16th Bn.) 31 May 1916 20 Son of Jonah & Elizabeth Phillips, of Gorphwysfa, Glyn Ceiriog. Loos Memorial, Pas de Calais, France. (10th Bn.) 20 Oct 1917 20 Son of Samuel & Elizabeth Roberts, of Glyn Ceiriog. Godewaervelde British Cemetery, Nord, France. (257th Tunnelling Coy.) 12 Aug 1917 34 Son of Robert & Mary Roberts, of Tanyberth, Glyn Ceiriog. Coxyde Military Cemetery, West-Vlaanderen, Belgium. (275th Siege Bty.) 14 Nov 1917 22 Son of Lloyd & Susannah Williams, of 3, Llangollen Terrace, Glyn Ceiriog. The Huts Cemetery, West-Vlaanderen, Belgium. 4199477 King's Own Royal Lancaster Regiment (2nd Bn.) 14 May 1944 28 Son of Hugh & Jane E. Griffiths, of Glyn Ceiriog. Taukkyan War Cemetery, Burma. (1st Royal Dragoons) 7 Dec 1942 23 Born in Glyn Ceiriog. Son of Henry and Sarah Griffiths, of Harlescott, Shropshire, England. Died of Diptheria. North Gate War Cemetery, Baghdad, Iraq. (2/6th Bn.) 8 Jul 1944 31 Son of Alfred & Margaret Hall, of Glyn Ceiriog. Cambes-en-Plaine War Cemetery, Calvados, France. (166 Sqdn.) 24 May 1943 23 Son of Lloyd & Martha Morris, 1, Nascott Terrace, Glyn Ceiriog. Haaksbergen General Cemetery, Overijssel, Netherlands. ROBERTS 25 Jan 1945 Of Chwarel, Glyn Ceiriog. Died at 31, Waverley Road, Sale, Cheshire, England.